Here's another recipe for a condiment that I'll be serving along with tonight's dinner, "Tequila Lime Chicken Fajitas." 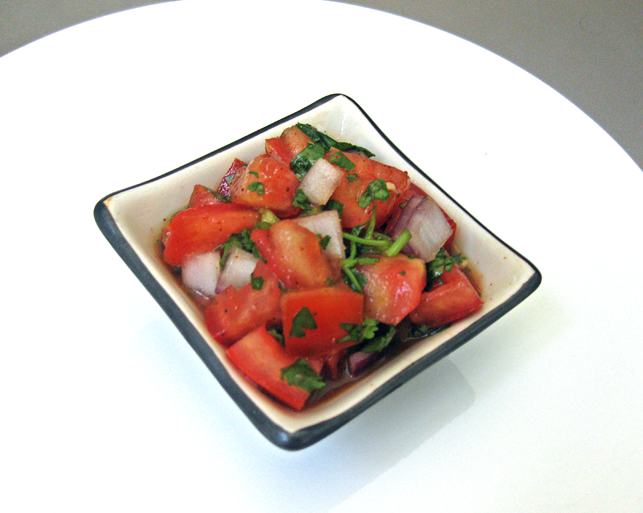 Some people think of pico de gallo as salsa; however, its simplest form, I'd say that it more closely resembles a side salad of marinated fresh raw chopped vegetables than an actual sauce/salsa per se. Directions: Mix together ingredients, marinate in refrigerator for 1-2 hours, & then serve. Chef's Notes: Some of you may prefer to drain (or seed) the tomatoes before incorporating them into the pico de gallo mixture. Or, alternatively, you could use quartered grape or cherry tomatoes, which contain less juice than the full-sized, vine-ripened variety.